Known to imbibe spiritual consciousness among people all over the world, the ISKCON temple has its South Indian headquarters in Hyderabad. This magnificent temple on Nampally Station Road serves as a centre of cultural, spiritual, educational and social activities given to uplift the lives of people in Hyderabad. The activities begin from 4.30 am with Mangala Arati and go on till 8.30 pm with activities like meditation, sringar darshan, lectures on Bhagwad Gita, and more. The beautiful architecture here involves intricate carvings, and the steps here have various halts that lead to further ends of the temple. Alongside the temple, there are shops and fountains which contribute to the spiritual aura of the shrine. There are stunning paintings, and the idol inside the temple is decked in rich clothes and jewellery. In the centre hall, you can feel the positive vibrations from the chanting of ‘Hare Rama, Hare Krishna’. There is also a big lawn behind the temple premises, where you can relax after a brief visit to the temple. 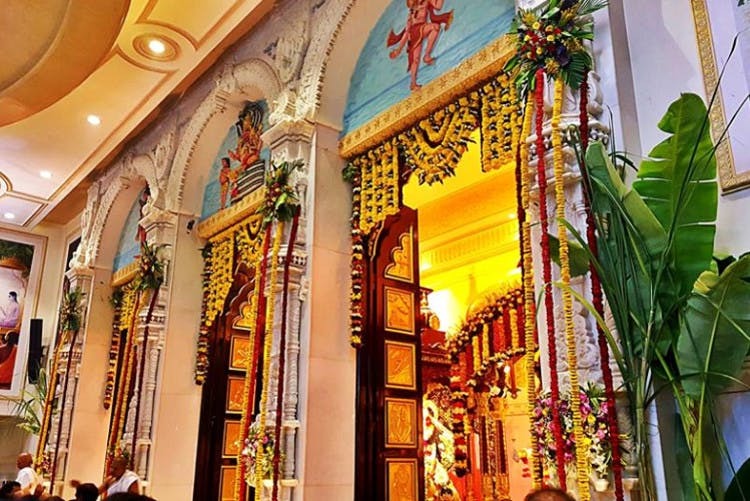 You can also visit the temple during festive times when it is all lit up and celebrations are grand, especially festivals like Janmashtami, Ramnavami, Radhashtami, Gaura Purnima where people can perform seva and be involved in temple activities. There are also special programs every Sunday, like the Sunday feast. Other activities include book distribution, yoga, youth program, Mahanagar Sankiratan. There is also a restaurant that serves delicious vegetarian food right at the entrance that you should totally check out. With an aim to develop the characters of individuals and to bring them closer to the spiritual truth, the temple holds seminars and activities to schools, colleges, professionals from all walks of life and various nationalities too. The temple provides accommodation to its lifetime members, and they can attend all the spiritual activities pertaining to arts, education, music (kirtan), food relief programs.